Great room, location and most of all a fantastic host! Highly recommend this place to anyone who would like to visit Kefalonia. Talia (the host) was helpful and informative and just super cool. The welcome from Thalia was lovely and she really looks after her guests. I was travelling alone so this was especially important. It is so peaceful and lovely, with a view over Olive groves to mount Aenos. Thalia is rightly very proud of her swimming pool which she designed herself and it is lovely. Apartment was clean with free air conditioning. Interesting selection of different nationality guests, very easy to relax. Thalia was a very warm and friendly host- nothing was too much trouble. The apartment was very clean and the pool and gardens were great. Within an hour (by car) every famous beach is available, Petani, Antisamos, Myrtos, Skala. The pool is very good. Thalia was very nice and helpful. Lovely pool. Basic but spacious and clean apartment with a large balcony overlooking the pool. Very good value for money. Thalia, the host, was very helpful at all times. We enjoyed our stay at the Aria Studios. Thalia was most helpful in sorting a hire car and spent time showing us sights and beaches to visit.. 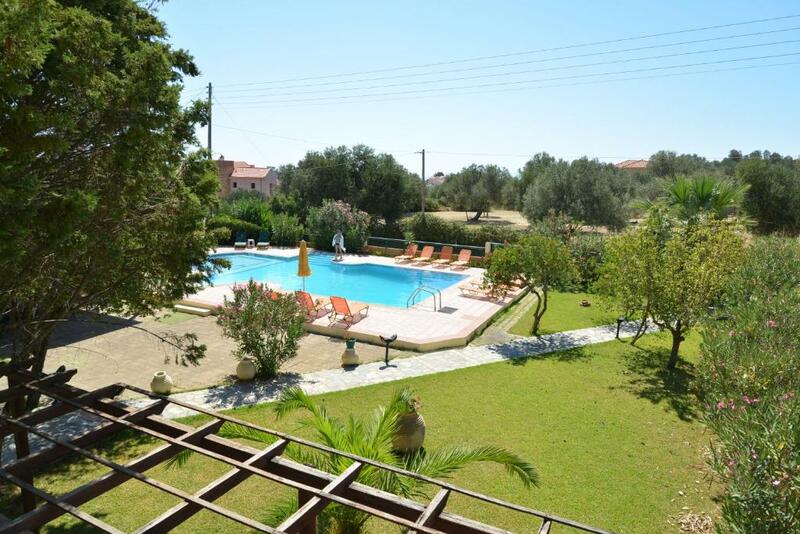 Aria is a lovely pension surrounded by olive trees. Big and nice garden with a swimming pool and a bar. Apartment studio is comfortable, big enough. Kitchen with all vessel, air conditioning, solid furniture and easy access. Big private parking place for at least 20 cars and convenient access to all places in Argostoli, Poros, or Sami area. Not far from beaches, however you need a car to go because none is in the waking distance. IMHO is the best place to stay if you plan to visit Argostoli, caves in Sami (Melissani, Drogarati), picturesque Skala or famous beaches in Skala-Poros region. Owner is nice and friendly. Lock in a great price for Aria - rated 8.3 by recent guests. Surrounded by well-tended gardens in Lakithra, Aria features a swimming pool and sun terrace with sun loungers. It offers self-catered accommodation with free Wi-Fi and furnished balcony with views of the rich greenery. A kitchenette with cooking facilities, fridge and dining area is included in all the air-conditioned units at the Aria. Each room has a private bathroom with hairdryer. Guests can enjoy the on-site pool bar. Lakithra village has shops and restaurants. Agios Georgios Castle is within 1.2 miles. Ammes Beach is at 2.5 miles while Argostoli, the capital of Kefalonia is 3.1 miles away. Free private parking is possible on site. This property is also rated for the best value in Lakithra! Guests are getting more for their money when compared to other properties in this city. Aria has been welcoming Booking.com guests since 25 Apr 2013. When would you like to stay at Aria? Air-conditioned studio offering free Wi-Fi and furnished balcony with views of the rich greenery. A kitchenette with cooking facilities, fridge and dining area is included. Air-conditioned apartment with separate bedroom and living area, offering free Wi-Fi and spacious, furnished balcony with views of the garden. A kitchenette with cooking facilities, fridge and dining area is included. Also a bathroom is offered. Its a family resort and provides the ultimate relaxing holidays. The big advantage is that the resort is near to the most famous beaches and from the capital Argostoli. The pool is awesome, big and very clean. Whatever you want just ask for it! I'm willing to help you! I am fan of sports and nature lover! The resort is placed at the village Lakithra. The neighboor is peaceful and with a spectacular view. The village has a lots of restaurants and tha distances from the island's sightseeings are short. House rules Aria takes special requests - add in the next step! All further children or adults are charged EUR 10 per night for extra beds. Please note that the pool operates from the 10th of June. Please note that the TV is only available on request. Not much really, loved every bit of it. Maybe have some to lend-litter boxes for people who stay with cats... just a thought! (Guests would have to clean them themselves before checking out). Property a bit tired but kept clean and presentable. Pool looks clean. Close to airport. Nice staff. There was no microwave oven. Kitchen could be a little better equipped. The weather was a little rainy! Nothing to say here, all good ! Incredibly clean apartment's & Thalia (owner) and her son were lovely and welcoming, and couldn't do enough to help. Great food at bar and also only a 20 minute walk away from the town. The property also had amazing views from the pool. If you don't have a car, the location is not close to beach. However, you may appreciate the beautiful pool. Thalia is a charming, efficient and relaxed hostess. He helped us rent the car and made valuable recommendations. The studio is spacious and the pool is phenomenal. Recommended!